Next Chapter . . . Pioneer Menu . . . Search - - Oldest presented first. Douglas County is part of the Big Bend Country of Central Washington. The Waterville Christian Church was organized in 1891 by George W. Ross, preacher from Spokane Falls. There were 35 charter members with five more being added soon after beginning. It was Judson Murray that reported the building dedication to the Christian Standard. Another family was that of William and Susan Ogle. His parents, Josephus and Delilah Jane may also have been involved. They had been members of the Keithsburg Church in Mercer Co., Illinois. One historian says, "They were consecrated members and most helpful to the church." The congregation dedicated their building mid-summer in 1892. They invited the well-known W. F. Cowden to offer the sermon on that occasion. In 1894 W. L. McCullough was minister of the church, as well as conducting nightly meetings in town near by. Other early members may have included: L. R. Francis and William Wise. 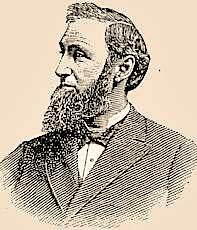 The minister about 1900 was George E. Borrows. Later he moved to outlying Mansfield, also in Douglas County, and planted a Christian Church. Mr. Borrows is buried in the Mansfield Cemetery. The Manfield Cemetery can be read online. The birth entry for Mr. Borrows should probably read 1855. Sometime in the mid-1930s the church combined with some others and was renamed the Federated Church of Waterville. Eventually the Federation included the Methodist, Presbyterian and Baptist Churches as well as the Christian Church.